According to the Oakland Tribune’s Steve Corkran, “chances are” Darren McFadden (foot) will not play on Thursday night against San Diego. The running game certainly wasn’t the problem in Sunday’s loss to the Denver Broncos. It actually looked quite well despite the Raiders were missing the leagues leading rusher McFadden prior to injury. Against the Broncos runningbacks Michael Bush and Taiwan Jones ran the ball for the bulk of the carries in the loss, but fans knew they were missing that spark from the offense, especially when the team needed to create their own noise against the wild Broncos running game. It appears McFadden will miss the coming game against the San Diego Chargers due to his injury as well and there still no telling of his exact return. Simply, McFadden, still hasn’t resumed running. He continues miss practice and didn’t participate in Monday’s session. If this occurs in by Wednesday walkthrough and it’s expected that he will be replaced by Bush and Jones against the Chargers. Corkran continues to explan, McFadden “still hasn’t so much as gone out for a leisurely jog” since suffering a mid-foot sprain on October 23. After Thursday night, the Raiders’ next game is on November 20, giving McFadden nearly a full month of off time. In essence now it looks more than clear he’s not making it out against the Raiders division rival Thursday night. He has not played or practiced since being injured early in the first quarter against Kansas City two games ago. Prior to the injury the 2011 season happen he looked great. McFadden was the leading rusher in the NFL and had 614 rushing yards and four touchdowns. 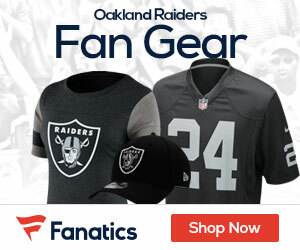 The midseason injury bug has hit the Raiders real bad on both sides of the ball actually at Monday’s practice session ten players did not practice, something a team cannot afford to have on a short week. Raiders, need to find somewhere, something, someone to simply motivate them put them back in contention before the injuries to Jason Campbell and McFadden oared. Its still a battle of the wild AFC western division any its any team reward can the Silver and Black take what rightfully theirs and advance to the playoffs from winning the division they need to find the spark again the magic they once had two weeks ago.